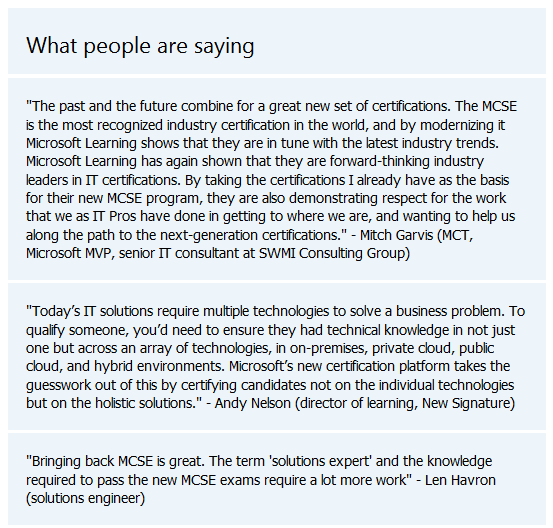 It is kind of cool when I find out that Microsoft Learning wants to feature a quote of mine on one of their pages. Veronica Sopher and I met in Redmond (well, Bellevue actually) in February and discussed at length some of the steps that Microsoft Learning is taking to engage the community, specifically MCTs. Since then we have done a couple of things together, most recently the Tweet-Chat for #20yrs20ways. A couple of weeks ago when Microsoft Learning announced their new certification model she asked me if I would be willing to give a quote on it for their website, and I did. That quote is now posted on their new page ‘MCSE: Reinvented for the Cloud’. Also on the same page is a video overview of the new MCSE: Private Cloud, as well as an FAQ, and links for exam vouchers, the Microsoft Certification Program, and a link to the MCSE: SQL Server 2012. Check it out!